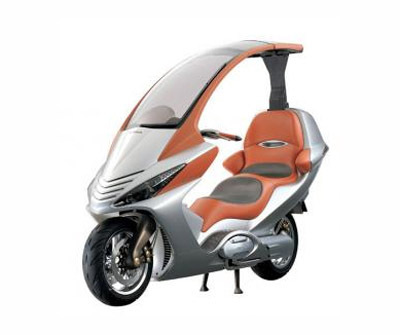 Honda's concept scooter, the Elysium, was a friendly, aesthetically pleasing, futuristic all-weather scooter. Not a unique idea but one of the better looking with some nice features, the top part of the roof can be folded back into the seat during better weather, and a monitor shows you whats going on behind. The Elysium was powered by a 750cc 4 stroke petrol engine.